When you're looking for an affordable and caring elderly residential care home in Hampshire, look no further than the friendly and knowledgeable team here at Remyck House Residential Care Home. 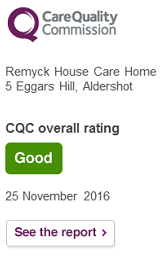 We are fully registered with the Care Quality Commission (CQC)) and we are proud to boast an exceptional reputation for providing affordable respite care for people aged over 65 and with Dementia. Remyck House Residential Care Home has been established for over 27 years and in this time we have built up an enviable reputation for the high standard of our facility and our retirement and respite care services. We offer residential care to the elderly and sufferers of Dementia and our team of experienced and friendly care staff are able to take care of every requirement. Our major clients include primary care trusts and Social Services, and we offer a sense of comfort and safety in your time of need. To find out more, please don't hesitate to contact us and we'll be happy to be of assistance in any way that we can. Respite care is available for those who require it, and we always endeavour to offer independence and a caring service to our patients when they come to stay. All of our staff are NVQ qualified in Social Care and above, and as we are registered with the Care Quality Commission, we are always striving to better ourselves and meet the care quality standards that we hold so highly. If you wish to find out more about our residential respite care home, please don't hesitate to contact Remyck House Residential Care Home today. You can reach us through our contact page, or by using the details to the side of the screen. If you're searching for residential care homes in Hampshire, please don't hesitate to contact us today and we will be happy to help answer any of your care questions.